Globaly, we have over 6 Billion Mobile Subscribers – India and China combined will soon have close to third of this market share. Chetan Sharma, a management consultant recently put out a slideshare presentation, which gives some interesting insights on the Global Mobile Industry. 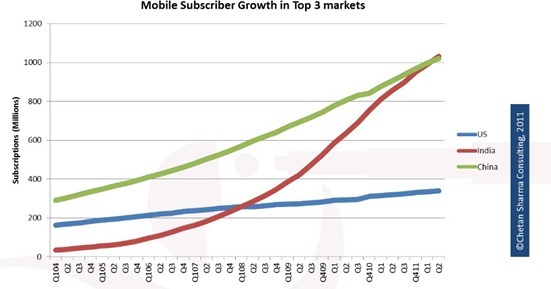 India will overtake China in terms of Mobile Subscriber base by 2nd quarter of 2012 and India is most likely to cross 1 Billion subscriber mark by 1st quarter! Aircel launches Cheap unlimited 3G plans! India reaches 851 Mln Mobile Subscribers –13 Mln make MNP requests! Video viewing consumes about 60% of total mobile data traffic in India! The points made under “Interesting Mobile Trends of 2011” are really very interesting. Useful and informative article ARUN,keep the good work going.